113 Wednesday August 3- 1932. We were late having breakfast. We went to Miss Louise Allens for lunch Mrs Falkner & Francis here for the evening. Harry did not go home today. Thursday August 4- 1932 We went to Peoria in the AM Mrs Smale spent the day with friends. We had lunch at Clarkes I staid there and wrote letters to Hattie Alice Condon and Will & Flora Lovegood I bought a hat. It was supper time when we got home. Harry had gone home Friday August 5- 1932. We drove to Springfield today after leaving Mrs Smale to spend the day with Mrs Price We met Harry and had lunch with him Mabel was to go on out home Home at 5-oclock and later got Mrs Smale and went to Fred Allens for the evening Letters from Winnie and Birdie Saturday August 6- 1932 I wrote Bro Ott & Ella Lovegood cards to Winnie and Mabel. Harry Wood came for Mrs Smale Later a hard wind and rain Slept part of PM. a letter from Ella Lovegood with a picture of Jane & Ira from a newspaper Sunday August 7- 1932. We went to SS. 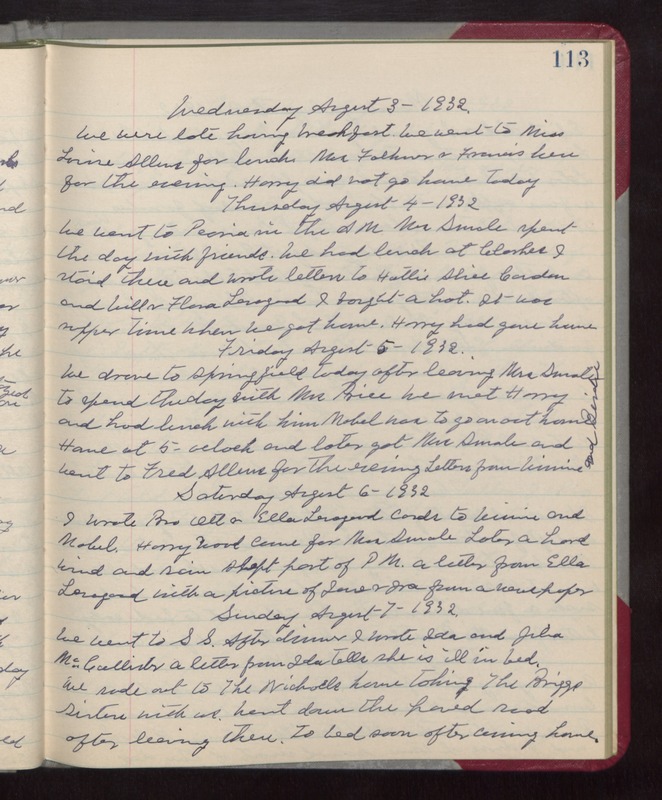 After dinner I wrote Ida and Julia McCallister a letter from Ida tells she is ill in bed. We rode out to The Nichoels home taking The Briggs Sisters with us. Went down the paved road after leaving there. To bed soon after coming home.